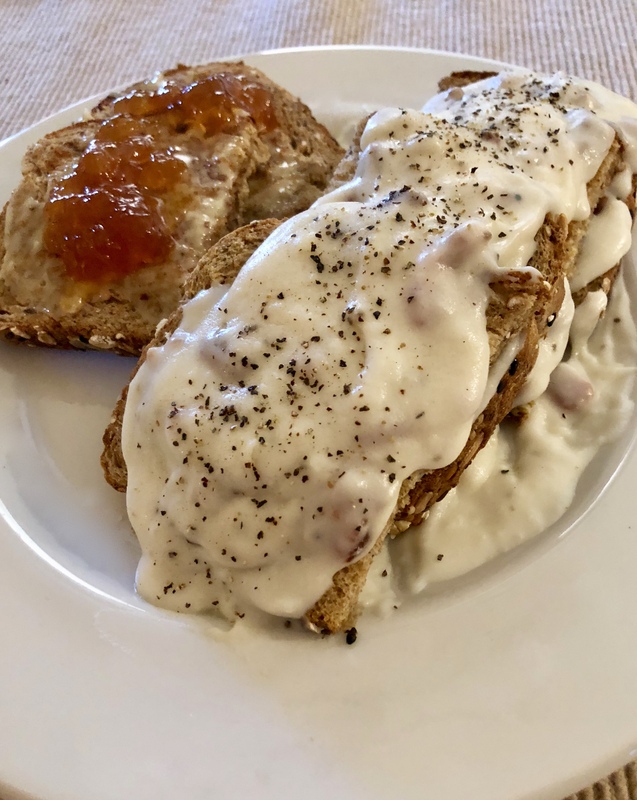 A short time ago, there was some Facebook discussion of SOS (chipped beef or hamburger in a white sauce served on toast. (In polite circles, I would call it “Served on a Shingle”, not what we called it in the military). It brought back memories of bootcamp breakfasts back in 1970-71. SOS stuck somewhere on the edge of short term memory in the back of my mind. It resurfaced with a craving this morning. I first thought a about biscuits and gravy after reading a note my Australian friend sent about educating his co-workers about the difference between biscuits and gravy in the southern US vs Australian biscuits that are what we would call cookies. Now that I am a septuagenarian, my thoughts sometimes work in mysterious ways. Biscuits and gravy became transformed to thoughts of SOS. I knew I didn’t have any hamburger or chipped beef or even sausage on hand, but I did have three strips of bacon left over from some I purchased to season a pot of beans last week. I was on my way to playing with breakfast without a recipe! I diced the bacon, placed it in a bowl, covered it with plastic wrapped and microwaved it three times at 45 seconds, stirring between zapps. The result was some nicely cooked diced bacon and just over two Tbsp of bacon fat. I strained the fat into a glass measure and stirred in two Tbsp flour. I zapped and stirred the flour and fat for 30 seconds four or five times, stirring it smooth between zapps. The objective was to cook the flour until it no longer tased raw. I then added small amounts of milk, did short zaps and lots of stirring as it thickened. After the the milk, zaps and stirs, I had a nice bacon gravy. I mixed the diced bacon back in and adjusted the seasoning with salt and pepper. For years, I have used this microwave technique on equal parts butter and flour followed by addidtions of cream to make a passable and quick béchamel sauce that can be modified into a rich white sauce or even a cheese sauce for different recipes. Pan-made béchamel is preferred for more upscale dishes, but the microwave version is fast and works for simple things and lower quantities the sauce. I made toast and plated it topped with the bacon sauce/gravy and christened it Bacon a Board because it was neither S nor on a shingle. This breakfast was a triple threat – I bought Menonite butter from the Menonite cheese guy at the Farmer’s market. It is salted, so I don’t use it for baking. It is great for spreading on toast. I had a piece of toast with Menonite butter and Stonewall, Texas, peach jam I had picked up while in Stonewall in June! BOB – Bacon on a Board: the foundation for a Bigified Breakfast inspired by SOS.